I recently came across an article that a couple of friends posted on social media recently. The headline caught my eye simply because I related to it – The depressing truth behind mums ‘unable’ to breastfeed. I put together three of the words – depressing, unable, breastfeed – and immediately thought of myself. If you have read my blog before you will know that I really struggled to breastfeed both J & N.
The months after J was born were some of the worst of my life because I was unable to breastfeed. I blamed myself, my body didn’t work properly, I couldn’t provide for my baby. My inability to breastfeed led to an enormous amount of breastfeeding guilt. In turn this led to me developing post natal depression. I mention in the post I linked to for the experience with J, that I had help from the support workers. But that was it. They could see that I couldn’t get J to latch, but they didn’t suggest anything else. Now I see it wasn’t my fault, but is a possibility that J had tongue tie; but nobody could diagnose that because I didn’t know about it back then, and nobody else mentioned it to me. So I gave up before I even really tried. My experience with N was slightly different in that I tried battling on for longer but we had the exact same problem – his latch, or lack of it. We had help from the NICU nurses when we were in transitional care, but nothing when we were discharged. I refused to give him formula as I was so so scared of developing breastfeeding guilt and depression again. The support workers came out to me a few times for a week or so after he was born, but every time they came out it was the same. They could see he couldn’t latch, but nothing else. We attempted, but no other suggestions, nothing. I was simply told as was said in the linked article, “Stick at it and it will click”. So we stuck at it. It didn’t click. This time though I didn’t blame myself as I know I tried my hardest for four weeks, on my own for the most part. Again, a friend mentioned to me recently that N could have tongue tie too. No-one mentioned anything during support. So far (fingers crossed) I have gotten away with developing depression because I was yet again unable to breastfeed. Both times, I believe I really could have done with specialist help. Maybe it would have made a difference, maybe it wouldn’t. But just the fact that it would have been a ‘professional’ rather than just support, might have helped me not to become another statistic. It is so sad and such a shame that there is no specialist help for so many women who really want to breastfeed. It’s okay saying that breast is the best option (which it is, I know), but where is the help, rather than just the support, if women don’t know about it and therefore can’t find it? 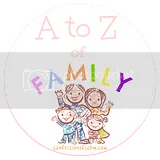 I’m going to be joining in with Confessions of a SAHM’s new linky, being the A-Z of family. Each week we will go through the alphabet writing a post about one word ascertaining to that weeks letter. I think this will be a good challenge to join in with! Becoming a family means adjustment. Adjustment to a new lifestyle, a new routine, new people. Nothing can prepare you for just how big that adjustment is. It’s OK going to antenatal classes and all that jazz, but when reality hits, woah, it’s a totally different league! I found it incredibly hard becoming a 3 person family, and as my regular readers and those who have been there from the beginning know, I struggled an awful lot and suffered from post natal depression. It was so hard to adjust – suddenly I had this new little fragile person to care for, who would be dependent on me (and his Daddy) for everything. Clothing, feeding, bathing. It wasn’t just me that I had to do it for anymore. I suddenly became second priority. Then when he was 6 months I unexpectedly fell pregnant again, naturally. I was even more terrified this time than the first time! Especially because I was suffering PND, I wasn’t ready. Caring for two little people only 15 months apart?! Unimaginable! I just didn’t know what to do. But of course I loved this new precious miracle life so much already. I had to adjust, yet again, so quickly. Unfortunately that wasn’t meant to be and it was another period of adjustment that our family of 4 wasn’t going to happen just yet, whilst grieving from losing a precious child. The miscarriage though, made us realise that yes, we did want this now, and whatever it took, we could do it. We could look after two little people. Heck, after the first one, you know what you’re doing right?! 6 months after our loss I fell pregnant for a third time. It was a tough few weeks up until our scan, but then I could relax a little (not much) and prepare for adjusting to becoming a family of 4, finally, hopefully. Fast forward 9 months and it was all real. Our second little man arrived, and it wasn’t only me & hubby that had to adjust, it was J also. For almost 2 years he had been an only child, and then this other little human comes and steals his limelight. This time, it was him that had the most difficulty adjusting. Though he has got there in the end. It kind of just slipped into place for us adults – I can say it was definitely easier adjusting to 2 children than to 1! Mummy guilt is something that I think most of us probably suffer from, for one reason or another. I know I have, with both of my boys throughout the last couple of years (and many more to come, I’m sure!). One of the first times I suffered – badly – was with my breastfeeding guilt after I failed with J. This partly led to my suffering from postnatal depression. Breastfeeding guilt is a horrible thing to feel, as everywhere you look you are reminded, of how you couldn’t/didn’t provide the best for your baby. I felt like I was being judged, by everyone – the PND made this 100x worse. Even if you feel you made the correct decision, it still creeps in. With J I now know I didn’t make that best decision, which is why I was more determined this time. This time I have suffered, but not nearly as much as I did with J, because this time I know I tried the hardest that I could. This time I am feeling more envy than guilt, which I will write about in a later post. Giving birth to N and these few first months, I have felt so much love for him and just wanted to be with him all of the time, and he still hasn’t had a night away from me like J did. I haven’t written this before so I am opening up a little more now, but with J – due to the PND – I just didn’t feel that and now I feel so guilty for him because he missed out on so much of my love, affection & attention. At every opportunity offered I would just ‘palm’ him off on someone else. He didn’t deserve that. He was just an innocent child, a child that just wanted, needed, to be unconditionally loved. Gosh, deep down I did love him, but it just wasn’t there, on the surface. And now I’m feeling almighty guilt. Now I obviously have to split my attention between the two and it’s only just in the last year or so that J has gotten my attention all to himself, and for that I feel guilty as my full attention has disappeared for him again. N will know no different, as he will from the beginning of his life, have had to share it. Don’t get me wrong, I do have one on one time with J now, he needs it. He has always been a child that needs lots of attention, and I often wonder if that’s because I didn’t give it to him for his first few months? But, they will never know my guilt, unless one day they choose to read my blog. The joy of innocence. I just hope that they both grow up knowing I have always loved them, and always will. That it’s those evil hormones of depression that have made me feel this way, and not them. Where in your motherhood journey have you experienced Mummy guilt? There isn’t much I can write about mental health that I haven’t previously written in the blog, If you have followed my journey since I gave birth to J you will know that I suffered from post natal depression & anxiety. I went on to have counselling and antidepressants. Ever since I fell pregnant with N I have been absolutely petrified that it would happen again after his birth. I came off my antidepressants at 10 weeks pregnant with N so from then on I just had to cope on my own. I didn’t have to stop taking them, but I felt like I might be able to manage so under the GP’s advice I gradually cut them out. I can say it hasn’t been at all easy. The pregnancy was hard what with constant worry after the miscarriage, add to that the feelings on becoming a Mummy of 2, and the tiredness. Oh, the tiredness. Since N was born, I have had some really tough days. Baby blues they could have been, but they have felt just like the PND did with J. They come & go though, so I have just put it down to tiredness, for now, and possibly baby blues. But this time I know the signs. As it could still come. I know when it’s time to talk.